Visit my new site Home Coffee Recipes for more! This is the Best Chocolate/ Mocha Frappuccino Recipe! I LOVE a mocha frappuccino. I used to hate coffee, even the slightest taste of it until I started working for my brother at his espresso stand. It didn’t take long before I discovered that I Loved the blended drinks. I still don’t like hot espresso drinks much, but those frappuccinos! Mmmm…. So, how do you make a mocha frappuccino? See my frappuccino recipe below…. This recipe is not trying to imitate the Starbucks frappuccino. In my opinion it is much better! Sugar– start with 3 tablespoons and go from there. 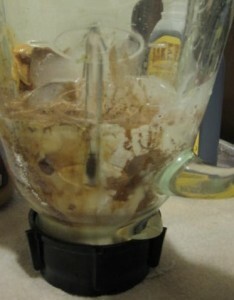 You can also use 1/4 cup Peanut Butter for a Chocolate Peanut Butter Mocha Frappuccino…. One of my favs! 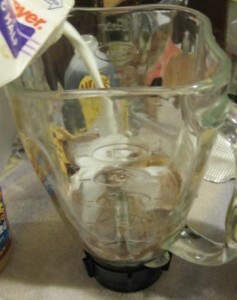 For Mocha Frappuccino: If you are using flavored syrup too, then only use about 1/3 of the cocoa powder. You can always use more if you like stronger chocolate taste. Now put in your sugar. 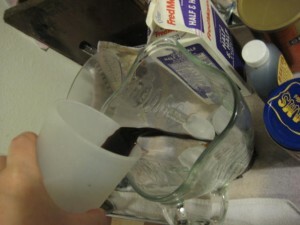 If you are not going to use any flavored syrup, then start with 3 tablespoons of sugar and use more if needed. 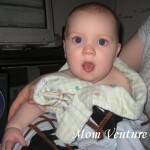 If you are using flavored syrup, then you can use probably about 1 tablespoon of sugar or none at all. If you want to add peanut butter, I just use about 1/4 cup for a 16oz frappuccino. I love using peanut butter with mocha frappuccinos. Chocolate/Peanut butter is the best! Now, add your espresso or coffee shots and the half & half, or milk (half & half tastes so much better. Just try it,,,just this once? I know it’s fattening, but one time won’t hurt will it? 🙂 ) You can use the measurement above or just pour the half & half directly into the blender up to just a couple ounces under whatever size drink you’re making. If it’s 16 oz, then just fill up to like 14 oz, so not quite to the top of the ice in the blender. Now you’re ready to blend! Blend for at least 20 seconds. If you don’t have the best blender then blend for longer. You don’t want ice chunks, you want nice and smooth! 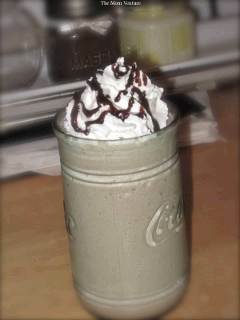 I’ll post some recipes for different flavored frappuccinos and mocha frappuccinos too! Snickers, Heath bar, Jack & Jill, and there are many more! Better than Starbucks 😉 This is an excellent chocolate frappuccino recipe you are sure to love! 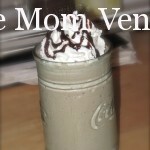 Easy to make and you can use this recipe as a base for many different flavors of frappuccinos! Sugar- start with 3 tablespoons and go from there. 2 oz or 6 pumps, Any flavored syrup if you want a flavored frappuccino or flavored mocha frappuccino. First make your espresso shots, or your coffee. 1 shot = 1 ounce, so if you’re like me and don’t like real strong drinks, I would use 1 shot for a 16-20oz drink, and 2 shots for a 24oz. But if you’re the average espresso drinker, or coffee drinker you should use 2 shots for 20oz and 3 for a 24oz drink. Make sure to chill the espresso or coffee first before adding it to the blender or it will melt the ice and won’t taste as good. 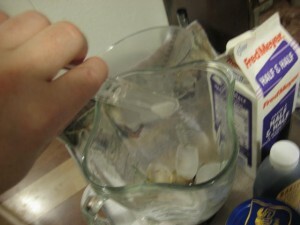 Or you can add an ice cube to it first and maybe some of the half and half or milk before pouring it into the blender. For the ice cubes you can just fill whatever cup you’re using with the ice cubes about 3/4 of the way and that should be just the right amount or use then measurement above. Then dump them into the blender. 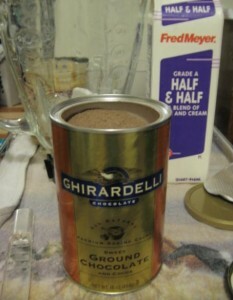 For Mocha Frappuccino: Put in the Cocoa powder (please try the cocoa powder if you never have, it tastes so much better! ). For a 16 oz mocha frappuccino drink use about 2 tablespoons, 20oz 2 and a half tablespoons and so on. Now, add your espresso or coffee shots and the half & half, or milk. You can use the measurement above or just pour the half & half directly into the blender up to just a couple ounces under whatever size drink you’re making. If it’s 16 oz, then just fill up to like 14 oz, so not quite to the top of the ice in the blender. Now that you know how to make a frappuccino, try this frappuccino recipe and let me know what you think! Did I explain everything clear enough? Did the measurements work out for you? Let me know! I’ve heard so many people complain about Starbucks’ coffee and how it doesn’t taste as good as other coffee. I personally can only drink Starbucks’ Americano coffee. Plus the ambiance in a Starbucks is part of the whole reason why I go there and why I’m a loyal customer. Say what you will, but Starbucks definitely knows how to market and brand themselves! First Off—Starbucks is the “fast food of coffee!” They produce an assembly line of consistent coffee drinks in which most taste good to the general demographics. If you like brewed coffee however, this is not the best tasting coffee (unless you prefer every origin of coffee to taste the same–BURNT that is!!! They have not only good marketing, but GREAT marketing!!! (and it does not take a skilled artisan to make their drinks)…i know, i worked there, and at an independent coffee roaster as well. 🙂 Both served as paid educations!!! I learned a ton from both! Starbucks has educated the mainstream in coffee culture 101…this will help up and coming shops in the future. Stay tuned for the The Trailer Perk, coming soon!!! Hey, I found your blog on google and read some of your other recipes. I love what you have tosay . I just added you to my Google News Reader. Keep up the good job. Look forward to reading more from you in the future. Starbucks is certainly one of those rare chains that actually lives up to the praise surrounding it. Nice coffee and other drinks, wonderful sweets, fabulous easy-going surroundings, it is simply an outstanding shop to relax, go on a date, get some work done, or whatever. Great recipe! I was looking for an easy one. I’ll be trying this tomorrow.. thanks.. 🙂 I’ll quoting you and your blog when I try this… will let you know.. take care..
No problem! Hope you like it 🙂 Thanks for stopping by! Hey, sorry I didn’t get back to you. 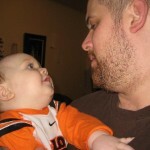 I kind of neglected my blog for awhile, but I’m hoping to get back to blogging regularly again. So to answer your question, I think if you only add 1 (probably about 3 tablespoons or 1oz) shot to a 16oz size drink, you should be fine. I don’t like mine strong either and so when I made myself blended drinks when I worked for my brother, I only used one shot instead of the standard 2 for a 16oz and it was just right. You can always add less coffee if you need to also. Also, using the half and half instead of regular milk helps too. I know a lot of people just use regular milk to make their homemade drinks, but half and half definitely makes them taste better and more creamy. 🙂 I hope that helped! 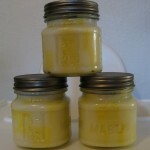 Let me know what you thought of the recipe. I’m going to try to add some more varieties of frappuccino flavored drinks soon too. P.S. So if your frappuccino maker calls for 3 tablespoons for an 8oz drink then I would definitely add only about half that to begin with. Can you tell me how to make a skinny frappuccino. This is probably a rather dumb question, but what is the best way to chill coffee overnight? I assume some type of thermos, but wouldn’t that actually keep the coffee hot, or is just a matter of leaving it in the refrigerator long enough? Jerry, Yeah, you can just leave the coffee in the fridge overnight. No need for a thermos. I just have a little 4 cup coffee maker and just take the glass coffee pot and stick it in the fridge. Your welcome! I’m so glad to hear you like it 🙂 Thanks for trying it out and taking the time to leave a comment.